From Goodreads ~ A remarkable cat. A special gift. A life-changing journey. They thought he was just a cat. When Oscar arrived at the Steere House Nursing and Rehabilitation Center in Rhode Island, he was a cute little guy with attitude. He loved to stretch out in a puddle of sunlight and chase his tail until he was dizzy. Occasionally he consented to a scratch behind the ears but only when it suited him. In other words, he was a typical cat. Or so it seemed. It wasn't long before Oscar had created something of a stir. Apparently this ordinary cat possesses an extraordinary gift: he knows instinctively when the end of life is near. Oscar is a welcome distraction for the residents of Steere House, many of whom are living with Alzheimer's. But he never spends much time with them - until they are in their last hours. Then, as if this were his job, Oscar strides purposely into a patient's room, curls up on the bed, and begins his vigil. Oscar provides comfort and companionship when people need him most. And his presence lets caregivers and loved ones know that it's time to say good-bye. Oscar was born in 2005 and is a therapy cat at the Steere House Nursing and Rehabilitation Center in Providence, RI, a 41-bed unit which treats people with Alzheimer's, Parkinson's disease and other illnesses, most of whom are in the end stage of life and are generally unaware of their surroundings. Oscar appears able to predict the impending death of terminally ill patients. When a patient is near death, Oscar jumps onto their bed and lays next to them until the end comes. 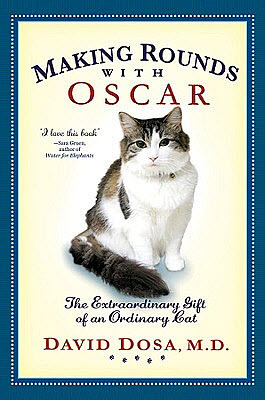 The author, Dr. David Dosa, is a geriatrician who isn't a fan of cats and is intrigued by Oscar. He interviews the families of former patients to determine a pattern. I was attracted to this book because it is about a cat. While I liked the book, I found it was more about Dr. Dosa, his patients, his family, his ailments and a focus in dementia/Alzheimer's than about Oscar ... Oscar had a minor part in the book. While it was an interesting book because I learned more about dementia and Alzheimer's, the cover and title lead me to believe it would be more focused on Oscar the cat actually making the rounds with the doctor. I thought the writing style was okay until it came to dialogue, which was unnatural and stilted. For example, every time Mary, who works at the centre, talked with Dr. Dosa, she'd say his name ... "David, you should talk with so-and-so ... David, there goes Oscar." She didn't need to say his name EVERY time they spoke ... he was standing RIGHT THERE and he knew she was talking to him.